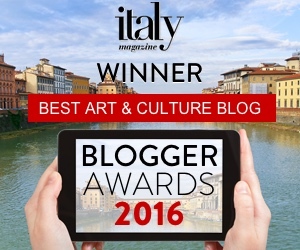 The grand palaces of Rome, their facades and courtyards, tell stories of papal and political alliances, nobility and wealth. Architecture here has always functioned as a way to communicate power. 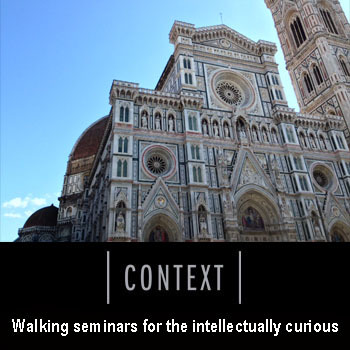 On Context Travel’s tour Popes, Power and Parties, Professor Linda Nolan decodes visual signs on the palaces in Renaissance Rome that us modern viewers may well have missed, showing how certain columns are actually a statement of who you know, and certain architectural features may be dictated by or permitted by who you are, or aren’t. I went along for the ride, and this is some of what I learned. This monumental palace announces the arrival of a “foreign” family in town. The noble Farnese family from Tuscia rose to power at the end of the 15th century through military service and some well-placed lovers. Alessandro Farnese became a cardinal in 1493, some say thanks to his sister’s role as the then-pope’s mistress; he later became Pope Paul III, in 1534. 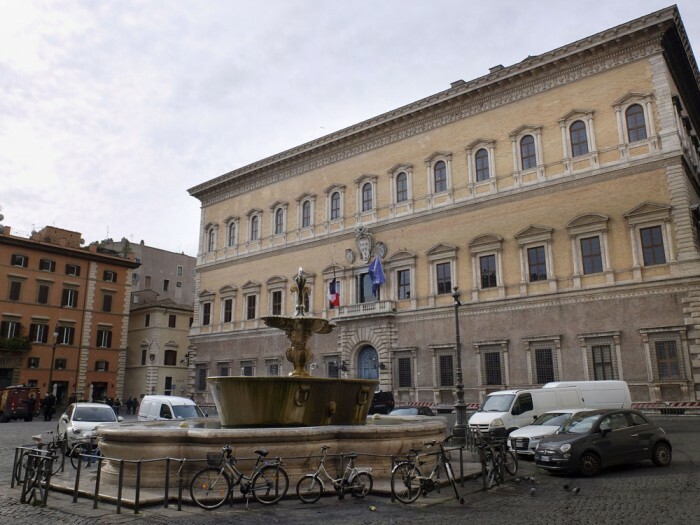 The piazza upon which the Farnese family chose to build their palace in the second decade of the 1500s existed in medieval times, but was much enlarged to accommodate their grand plans of a huge palazzo, twin fountains, and a noble space out front to use for feasts and the like. Aligning himself with papal architectural choices, Alessandro chose Antonio da Sangallo as architect, and later also employed Michelangelo – both architects also worked on New Saint Peter’s which was in construction during the same years. We can mainly observe this palace from the exterior now since it is the seat of the French Embassy, though inside visits are available in Italian and French through an association, with advance booking. 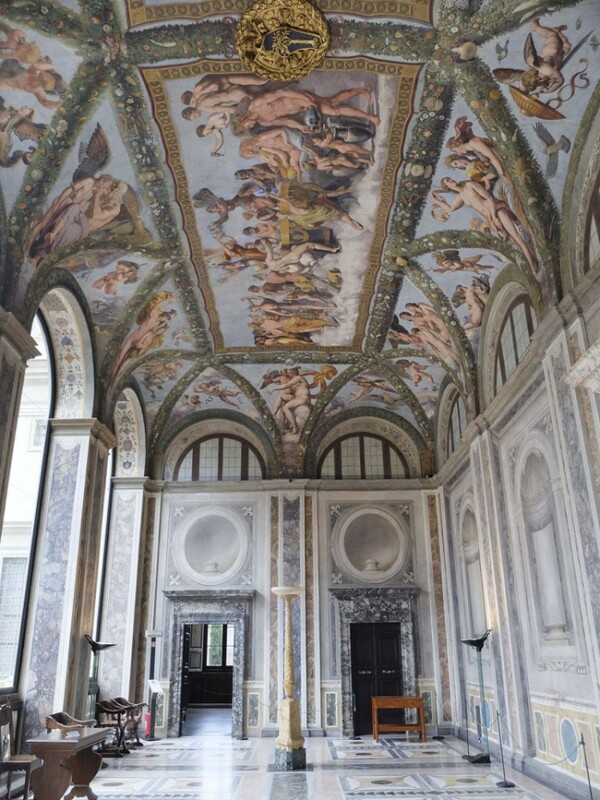 Inside there are spectacular frescoes on the piano nobile, and a huge and well balanced Renaissance courtyard that you can explore using the embassy’s virtual visit feature. What does the exterior of the building tell us? Well for one, it shows power through pure size! The wall decoration gets more ornate as it moves upwards, as does the architecture surrounding the windows. To show their wealth, the Farnese family, like others in similar positions, would be very generous towards area residents. 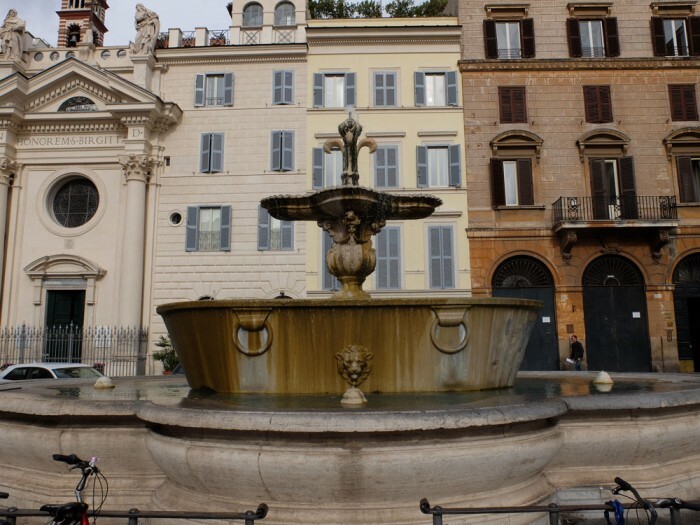 First of all, they put fountains in the piazza, which was a huge treat for residents who would not have to go to the Tiber River to get water. But of course these aren’t just practical. The huge Egyptian granite basins, over the edges of which water flows, come from the baths of Caracalla, drawing an ancient lineage and showing their ability to source materials from important locations of the past. Another “public” space in the piazza are the comfortable benches that line the sides of the palace, sheltered from sun and rain by the enormous cornice of the palace that juts out more than usual. This upper part was designed by Michelangelo and although it seems ginormous, it balances out the huge palazzo and gives it a significant “finish”. People would sit on these benches waiting for an audience with the family’s ruler, sometimes for days. Sitting here shows your alliance with the family, but it also makes the piazza into something of a living room for local gossip. Finally, the piazza itself extends the space of the palace into the public realm, ideal for parties when you don’t quite want to invite those people into your house, or when the activities called for larger spaces, like a bull fight – shown in a print from 1535 circa, when the fountains were not yet in place (an earlier single-tub fountain is just outside the front door). The family would often sponsor feasts, blessings and fun here. 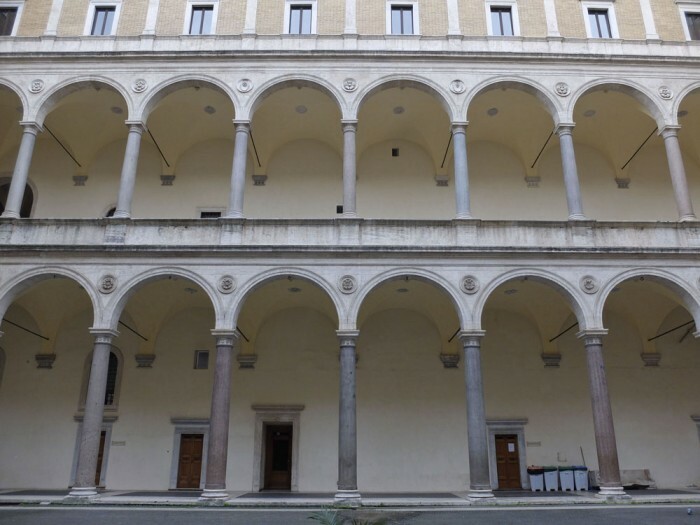 This combination of façade, interior courtyard, and exterior piazza as extension is the typical format for a Renaissance palace. A similarly structured palazzo can be found not far away with the Palazzo della Cancelleria, built for Cardinal Raffaele Riario (who held the money bags for Pope Sixtus IV della Rovere), possibly with an architectural contribution by Bramante, between 1489 and 1513. Riario didn’t get to enjoy his palace, since being an enemy of the Medici family never gets you a long way – he was kicked out by Pope Leo X in 1513. This palazzo is earlier than the Farnese one, and sets the tone for Renaissance palaces in Rome. In decoration and shape, it draws a lot from Quattrocento models in Florence like the Medici palace and Palazzo Strozzi and written about by Leon Battista Alberti in his book On Architecture. 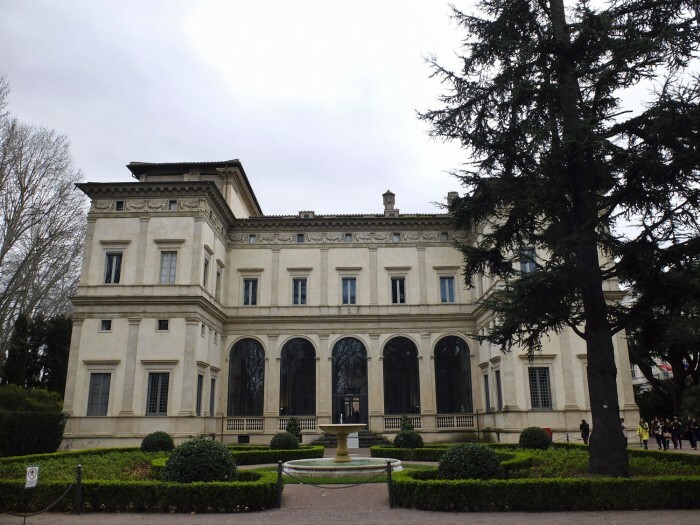 While we couldn’t go inside the Farnese Palace, the courtyard of this palace is open to the public. A print by Giuseppe Vasi from the 18th century shows the sheer size of the palace, but what is interesting is that much of it is “hollow” to accommodate a particularly grand central courtyard. 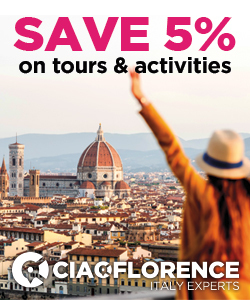 Linda explained that one reason for this feature is that Rome was a particularly dangerous city in those days, so you’d want to have a wide doorway and large courtyard into which to drive your carriage. 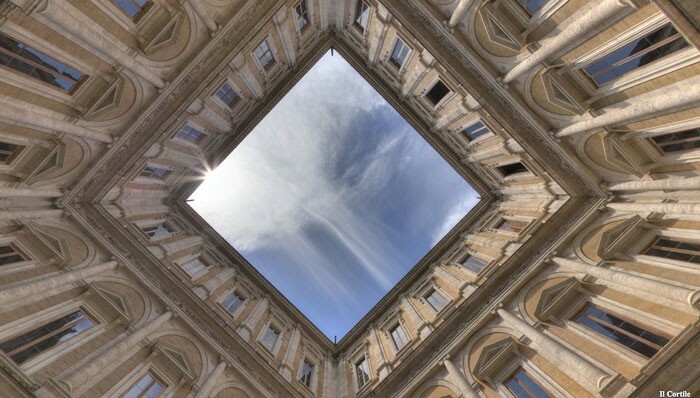 This palazzo turns everything inwards – in addition to “indoor parking”, a door at the far end of the courtyard probably led into an area used to stable horses and farm animals who would provide milk and eggs for the building’s residents. 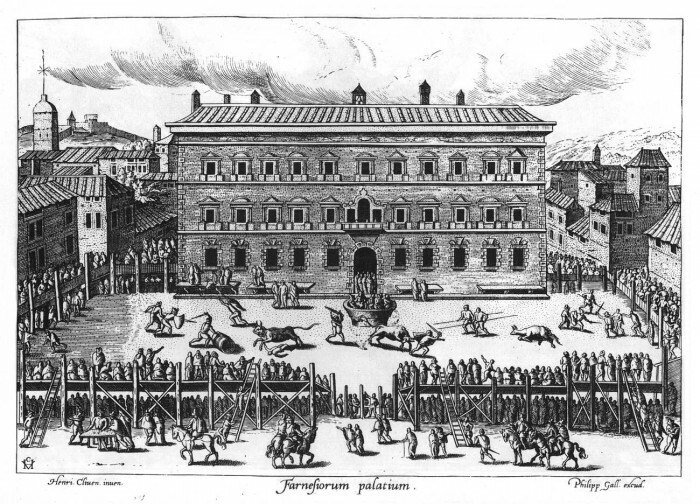 The courtyard itself was a showpiece of power: the pink and grey Egyptian granite columns were pillaged from the ruins of the nearby Theatre of Pompey, for which Riario would have gotten a time-stamped permit to take as much as he wanted in x days. At the time, this as not considered ruining a previous building but a way of giving it new life! The impressive architecture and columns-with-history were there to set a scene for a space that was not just practical, but part of the cardinal’s passion for collecting. Underneath the arches, protected from the elements, early drawings show this space used to display the cardinal’s collection of ancient statues. In fact, you might remember the name Cardinal Riario as being the guy who was temporarily duped by the young Michelangelo’s “fake antique Cupid”; he appreciated the joke and invited the artist for a visit, commissioning the Bacchus now in the Bargello in Florence. For a change of scene, we’ll head over to Trastevere, where my favourite thing to visit has always been the Villa Farnesina. This palazzo is really different from the other Renaissance onces, but until Linda Nolan’s tour I didn’t realize why, at least from an architectural point of view. We enter the grounds of Villa Farnesina through a gate and we arrive at its side, which is probably why I never got a good look at the building from its intended viewpoint, the front. Walk around to the left and you’ll see it the way the architect intended it. 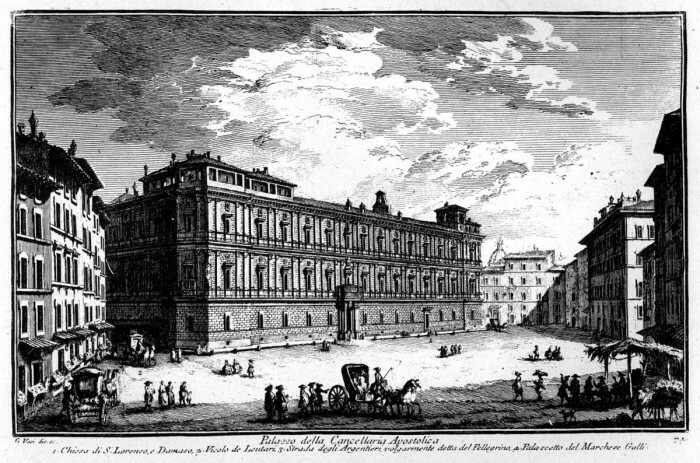 Agostino Chigi, the guy who had this palace built, was not a noble. 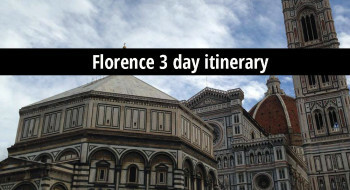 He was banker to Pope Julius II (the guy who kept Michelangelo busy for most of his life), and he used this connection to get everything from a discount on the property to a suitable wife. Failing to marry a noblewoman, he managed to get himself adopted by the pope (and then married his non-noble girlfriend). 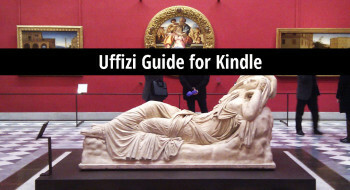 He hired Baldassare Peruzzi as architect, and employed painters including Raphael (whom he borrowed from his patron), Giulio Romano, Sebastiano del Piombo and Il Sodoma. Having money helps, but he also had some taste, albeit a bit unusual. Seeing the building from its front, you can see that the property slopes down towards an entrance that seems to embrace you – a central area and two wings, like a courtyard cut open. Not being noble, Chigi didn’t have to impose and impress. His desire was to emulate the ancient concept of Roman houses intended to combine business and pleasure, a type of building for which there were descriptions but no extant examples. Chigi needed a house for parties and to conduct business, which may have often overlapped. Large spaces flow into each other, but most didn’t have a specific function, so that he could transform the place as needed. An open loggia, and a summer dining pavilion along the banks of the Tiber took advantage of the long Roman summers. If you’ve ever been to a wedding in an Italian villa, you can imagine what the atmosphere would have been – plenty of different spaces to move around in order to maximize the time spent eating and drinking. Except, quite possibly, with the addition of orgies. The explicitly sexual nature of some of the paintings in the Farnesina let us know about the function of these spaces – a bedroom painted by Il Sodoma (famous for his own sexual adventures) shows the marriage of Alexander the Great and Roxana, a story described by Lucian, but rendered with modern furniture and deceptive depth. Separated by just one door from the first floor banquet hall, one gets the sense that Chigi was quite the Latin lover (pun intended). The ground floor loggia fresco of Cupid and Psyche tells the story of what happens when Cupid falls in love with a mortal woman. 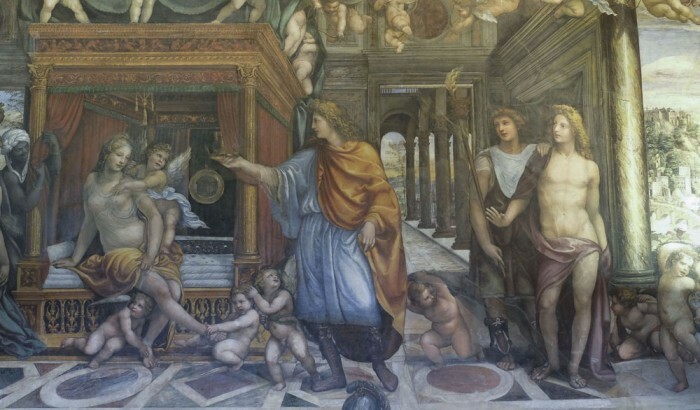 Read from left to right, with two large scenes in the center, the frescoes designed by Raphael and executed mostly by Giulio Romano are also a nod to papal power and correct comportment. For example, in the marriage banquet scene, all the gods and goddesses are “properly paired” with their companions, in respect for the sacraments about which the papal court was trying to remind people. 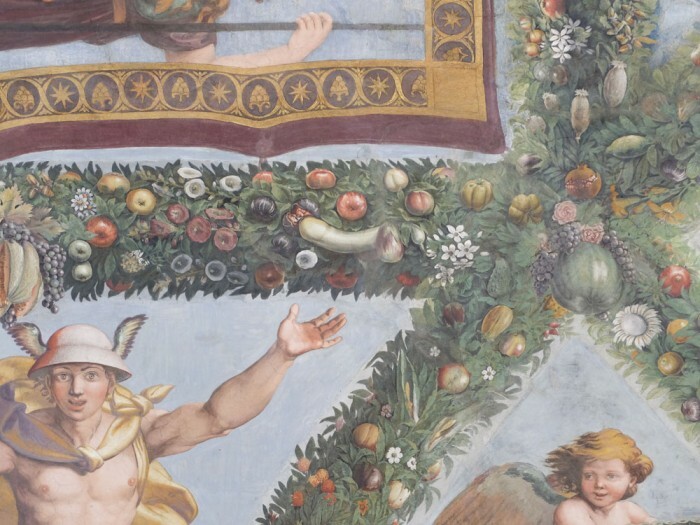 But should you think the fresco is overly serious or religious, peel your eyes for rude combinations of fruits and vegetables, of which there are various in the festoons by the hand of Giulio Romano. 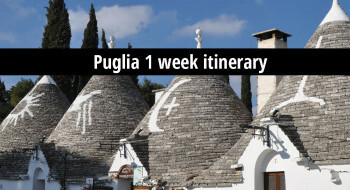 On our Popes, Power and Parties tour we visited these three buildings as well as a few other highlights along the way, and believe it or not, I haven’t shared every bit of the knowledge Linda imparted in the four hours we spent together! What I really liked about this tour was how it was like a seminar in advanced art history, with a clear thematic focus: the way that patrons in Renaissance Rome used buildings to communicate their social status. 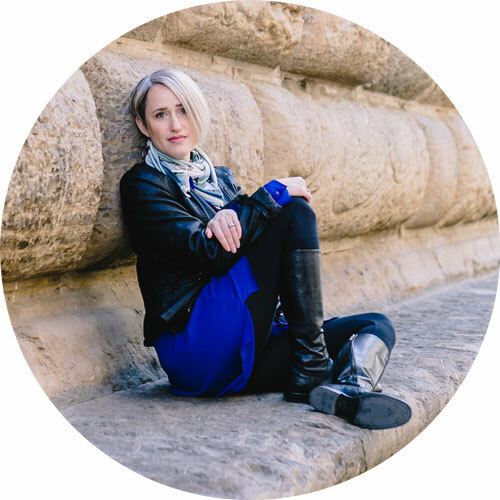 Even though I already know a fair amount about the period, Linda’s expertise shone through: she’s able to adapt the content of her seminars depending on how much you already know. *Any factual errors in this article are my own oversights, please let me know in the comments!